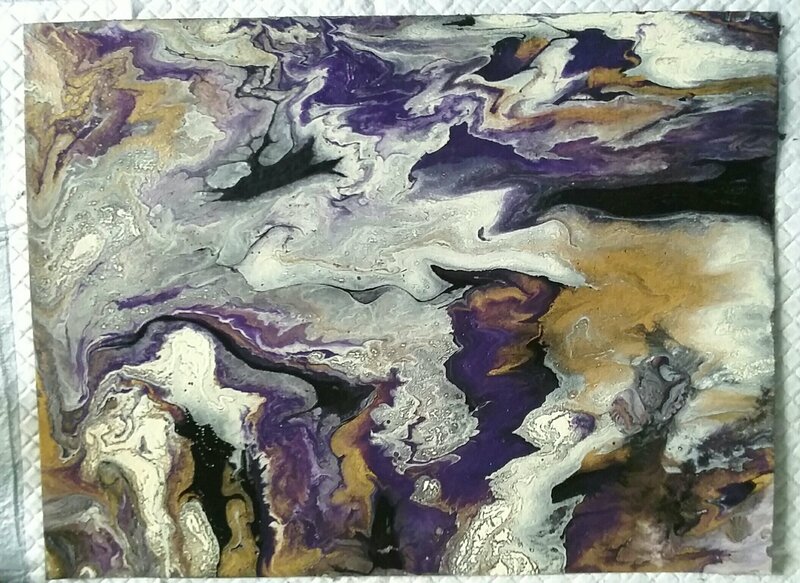 Trying something new… it’s called an “Acrylic Pour” painting. I watched enough YouTube tutorials to notice a lot of conflicting information about what to do or not do, use or not use, so I’m just going to have to experiment with different things and learn as I go. Welcome to my Weekly Pour, with liner notes kept here on this blog. 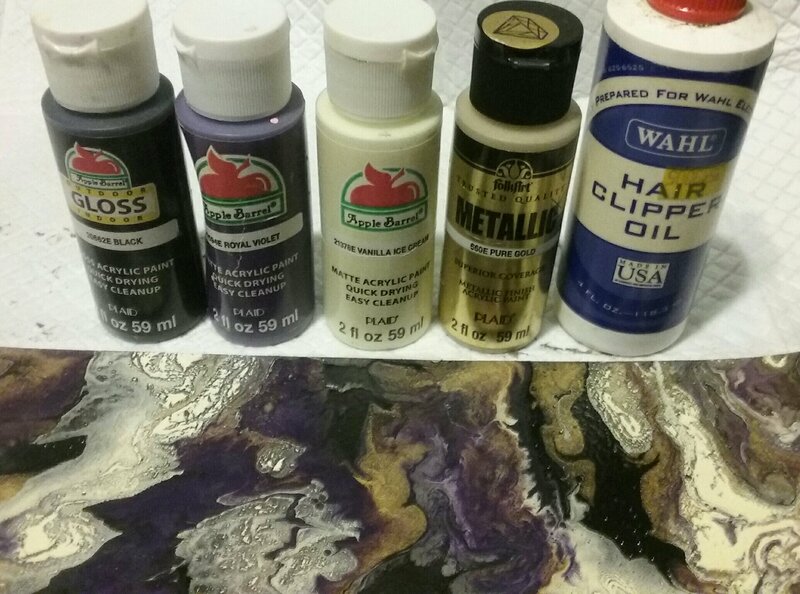 Here’s the basics gleamed from tutorials: acrylic paint is mixed ye 1:1 with some kind of flow medium (purchased or glue based), thinned with water if necessary, and some people add drops of some sort of additive (silicone, coconut hair oil, isopropyl alcohol, etc.) to promote cell formation. Then the paint mixtures are (a) layered in a cup that has or has not been lubricated, which is flipped upside down onto the ground (everything from “only use” gallery stretched artist grade canvas to squares cut from ordinary ol’ cardboard boxes were shown in videos) that may, or may not have been prepped with gesso, paint, or water. OR, (b) poured directly onto the ground by a method or any ol’ way you please. Patience required. Let it rest a bit before lifting cup (if dumping from a cup) and rest again before slowly tilting your ground this way or that in an attempt to make the paint flow in a manner that pleases you and covers the entire ground. Use a blow torch, if desired, to help raise cells. You can also blow air through straws, dab drips or add leftover paint mixtures to achieve desired effects. Dry time varies from 24 hours to darn near a full week. What I tried: this was a complete “use what you got” experiment. Yep, and glass shot glasses will do if you don’t have a stash of little plastic cups. PAINT: little bottles of Plaid brand craft acrylics EXCEPT for the white. I had an old, almost dried out, tube of Titanium White from Winsor & Newton’s discontinued line of Finity Acrylics that I diluted with water to the consistency of the craft paint. I know that mixture was nice and smooth and totally lump free as I used a little wire wisk to mix it. FLOW MEDIUM: used the 65% Elmer’s GLUE ALL recipe, 35% water. GROUND: Since it’s just a practice piece, I used an old discolored sheet of 140 lb, 100% cotton, cold pressed watercolor paper that I prepped by wetting with water on both sides. METHOD: layered paint in two Tupperware Midgets that I had lightly greased with coconut hair balm (as a release agent), flipped both upside down, let it rest awhile, then lifted the cups (in the sliding motion shown in tutorial videos) to let the paint flow. Let it rest again, then started tilting the ground. Talk about a royal muddy mess with little white globs that looked like cottage cheese floating all over my paper! Oh my gosh… I was grabbing paper towel and soaking up left and right… photo snapped after I got as much off as possible. Well, for starters, chemistry! Apparently, the Titanium White had some kind of delayed reaction to the alcohol, something in the glue, or maybe even contact with the trace amount of hair balm that lubed the pouring cup, as it went in smooth and came out lumpy. It didn’t seem to bother the craft paints. As the white was vacating, they started blending together, having a little mixer party in the cup. Nah… on to the next pour, using this same sheet of paper. I’ll post that next.